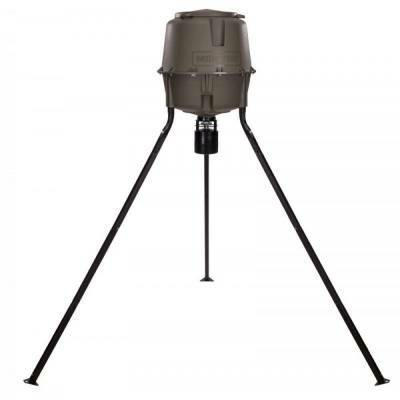 Moultrie Elite Tripod Deer Feeder. Top-of-the-line deer feeder offers total flexibility plus easy tool-free assembly with Moultrie's Quick-Lock modular technology. Fully programmable and adjustable to allow daily feeding times of your choosing and make the feeder short or tall. Features metal moving parts and a wind-resistant metal spin plate and funnel. UV-resistant plastic Quick-Lock hopper assembles in a snap without tools. Square, locking legs and feeder feet add stability. 360 degree feed pattern.